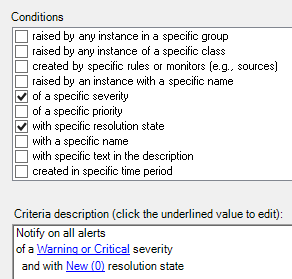 Can I setup alert emails to repeat at specific intervals if the alert has not been acknowledged? This is very simple, though you will end up with multiple subscriptions for the same purpose, which isn’t an issue if you’ve got some fairly basic subscriptions. Your second should be set up with “Delay” and set a delay against it. 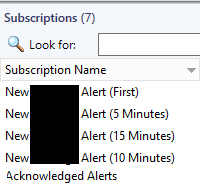 You can have separate channels for your 5 minute (change the Subject line to give insight into how long an alert has been waiting), 10 minute and 15 minute alerts. The criteria can remain on the same, though if you want to, you can set up one final subscription with the “Acknowledged” resolution state and a different channel to say it’s been acknowledged. In my experience though, this can cause more noise than it’s worth. I use a different way to do this. For instance, we don’t want to miss that a server is down in the middle of an alert storm so we have the following script that runs every hour. It also changes the subject so that the alert contains an “!” to indicate a repeated alert. The ($_.Name -like “*Failed to Connect to Computer*”)}) can be changed to what ever alerts you want to want to repeat alert on. If you only want to target particular machines you can add another filter e.g. To avoid this also picking up "Acknowledged" you'll also need to add the resolution state to the filter.